Though Walt Disney Animation Studios has existed in some form for almost 90 years, there is no more important period in its history than the Disney Renaissance, which lasted for the final 15 years of the 20th century. This is the era when more than a handful of Disney’s recent financial, if not full-throated creative, triumphs were released, from the more modestly successful The Great Mouse Detective to The Little Mermaid to The Lion King to Fantasia 2000. (The term “Disney Renaissance” was coined by fans, not in-house, so the definition of when the period extends from can, and should, be stretched to include both the 1986 Sherlock Holmes-esque adaptation that convinced Disney executives to keep funding animated projects and the 1999 “sequel” to Fantasia, which is a fitting tribute to the 1940 classic.) The Disney Renaissance, despite encompassing so many different films, is best identified by a series of elements that now approach the level of cliché: a fairy-tale-inspired story, an epic romance, catchy songs, goofy comic-relief sidekicks, and a fearsome-yet-charming villain. Just one film occupies the peak of Disney’s Renaissance period, proving so brilliant and influential that the studio has tried and failed over the last 25 years to replicate its power: Beauty And The Beast. Even now, on its 25th anniversary, Beauty And The Beast stands apart from Disney’s other modern hits, as well as those from its sister company, Pixar, and its animation-studio competitors. It’s the first animated film to be nominated for a Best Picture Oscar. (Up and Toy Story 3 have since gotten the nod, but only when the field of nominees was doubled to 10.) It’s the first Disney film used as the foundation for a Broadway musical. And at the time, it was Disney’s most financially successful animated film. In a few months, Disney will release the highly anticipated live-action remake of the 1991 animated film, starring Emma Watson, Dan Stevens, and Ewan McGregor, on its way to almost certainly becoming Disney’s biggest animation remake to date. Creatively, Beauty And The Beast is the apotheosis of everything Walt Disney Animation Studios made in between its first Golden Age (ending with Bambi) and the present. Beauty And The Beast is a beautiful synthesis of old-fashioned and modern aspects; it is more progressive than previous Disney princess films while hewing to familiar tropes. Our heroine, the brainy but beautiful Belle, would typically wind up with the equally attractive Gaston, whose looks are such that other women in the small town where everyone lives swoon and faint when he walks by them. But the story zigs instead of zagging in its romance. Belle is headstrong and courageous enough to save her inventor father from the clutches of a vain prince-turned-tortured-beast; though she starts as the Beast’s prisoner, the two eventually, genuinely fall in love with each other at his castle in the middle of nowhere. Often, Disney romances play out in predictable, sometimes dull fashion: Two pretty people without a ton of personality fall in love, primarily because the story demands it. If there’s anything that undercuts the power and emotion of this film’s romance, it’s that the Beast turns into a conventionally attractive young man in the finale, even though Belle fell for a monstrous-looking creature first. Yet even that reveal can’t rob the climax of its emotional heft. Beauty And The Beast balances the old and the new in its soundtrack, too, paying homage to the Tin Pan Alley-inspired songs of past Disney films, while making music that feels fresh and vibrant. Herein lies a big reason why Beauty And The Beast is so special, and why Disney’s subsequent animated films—even the very good ones, like The Princess And The Frog—can’t quite measure up. Considering the dark, tragic emotions infusing the film’s setup, wherein an obnoxious teenager is cursed for turning away the wrong old lady from his castle, it’s oddly fitting that the production of the film was marked by heartbreak during what should have been Disney’s finest moment. In March of 1991, the film’s creative team presented an unfinished section to the press, who responded passionately; producer Don Hahn went to a nearby NYC hospital to share the good news with the film’s lyricist, Howard Ashman, who was dying of AIDS. But Ashman’s health was deteriorating quickly, and he died only a few days later, never to see a finished version of the film that he and composer Alan Menken helped turn into the company’s modern masterpiece. As it goes with every Disney animated musical, the songs are the soul of Beauty And The Beast, proving instrumental in showcasing the whole cast instead of one or two performers. There are six songs here, all of which—on their own—could easily be considered one of the great Disney numbers. The opening sequence (“Belle”) introduces a good chunk of the major players with a conversational musicality to rival the work of Stephen Sondheim. Menken has acknowledged how worried he and Ashman were that Disney would nix the idea; the conventional wisdom is that modern audiences are repelled by musicals, and an opening number that extends to nearly seven minutes must have seemed like pushing their luck. The opposite turned out to be true: “Belle” may not be the most hummable of the modern Disney songs, but it is among the most memorable, calmly and confidently cementing the small-town struggle at the heart of the film, between conforming to others’ expectations and marching to your own beat. Like “Belle,” many of the other songs in Beauty And The Beast put the spotlight on the supporting cast; Paige O’Hara and Robby Benson, as Belle and the Beast, only share singing duties on one number, and even then, they’re joined by other performers. “Be Our Guest” is one of the great crowd-pleasing numbers of Disney history, helping cement the studio’s modern penchant for rousing the audience, to the point that Aladdin makes fun of the same in “Friend Like Me” (another Ashman song) with a neon “Applause” sign over the Genie. It’s also anchored by Jerry Orbach’s Maurice Chevalier-tinged performance as the jovial Lumiere, who shares comic-relief duties with the pompous Cogsworth. “Gaston” features the inverse of their Abbott-and-Costello relationship with the nefarious Gaston and his lapdog friend LeFou, as well as some of the most enviably good lyrics in any modern musical. Think of back-and-forths like “LeFou, I’m afraid I’ve been thinking” / “A dangerous pastime” / “I know” or loudmouthed brags like “I’m especially good at expectorating,” all set to one of Menken’s best, bounciest tunes. The title song, famously recorded by Angela Lansbury in one take despite her doubts that she was the right person to sing it at all, represents one of the studio’s finest, most direct, and honest love ballads. The sequence is gorgeously rendered, fusing early computer animation with sumptuous hand-drawn visuals; Lansbury’s multilayered vocals provide the best possible underlining to the images. “Something There” is a nearly equivalent love song, where both Belle and the Beast tease out their complicated feelings for each other in ways that manage to seem completely true, in spite of the utterly ridiculous fashion in which they meet and fall for each other. Even “The Mob Song” is a fine, intense combination of heroes and villains preparing to square off in a final showdown. (A display of Ashman’s influence and influences: Gaston’s line “Screw your courage to the sticking place” is not only a reference to Macbeth but inspired also Lin-Manuel Miranda in composing “Take A Break” from Hamilton.) If a Disney film had just one of these songs, it would be lucky. For a Disney film to have all of these songs—literally written on Ashman’s deathbed, as if his work wasn’t incredible enough—is a miracle. Hundreds of people contributed to the success of Beauty And The Beast, from directors Gary Trousdale and Kirk Wise, to Hahn as producer, to countless animators, to voice performers like Orbach, Benson, O’Hara, Lansbury, and Richard White as Gaston. The film they collaborated on is (thankfully) a far cry from its earlier conception by director Richard Purdum, which would have leaned far too hard into stateliness, as opposed to the warm-hearted version we have. That comes straight from the original French fairy tale, but Purdum’s version—part of which is available on the recent Blu-ray as a special feature—suggests a take as buttoned-up and rigid as the clothing its characters wear. (Amazingly, Purdum’s version would have eschewed songs, even after the success of The Little Mermaid and Oliver & Company.) This Beauty And The Beast stands out because its heroine has more to her life than just the desire to meet a man; its lead male character is painfully flawed right up to the climax, when he literally holds Gaston’s life in his furry hands. And there’s a sense of depth to its world that’s lacking from many other (and otherwise decent-to-very-good) Disney Renaissance films. Beauty represents the best of the Renaissance; the rest of the 1990s were marked by Disney trying to ape its style with diminishing returns. Both Pocahontas and Mulan feature strong female leads who don’t intend to be defined by marriage; those films, as well as Hercules and The Hunchback Of Notre Dame, attempt to develop both sides of the eventual romance, which is a far cry from the days of Snow White And The Seven Dwarfs and even The Little Mermaid, where Prince Eric feels more like window dressing than a person. These stabs at better character development and storytelling are admirable, at least, and Pocahontas and The Hunchback Of Notre Dame, specifically, are notably ambitious in spite of not being wholly entertaining. Even Aladdin and The Lion King, two financially profitable, male-driven stories, have more imbalanced narratives and relationships, with its supporting characters standing out far beyond the leads. 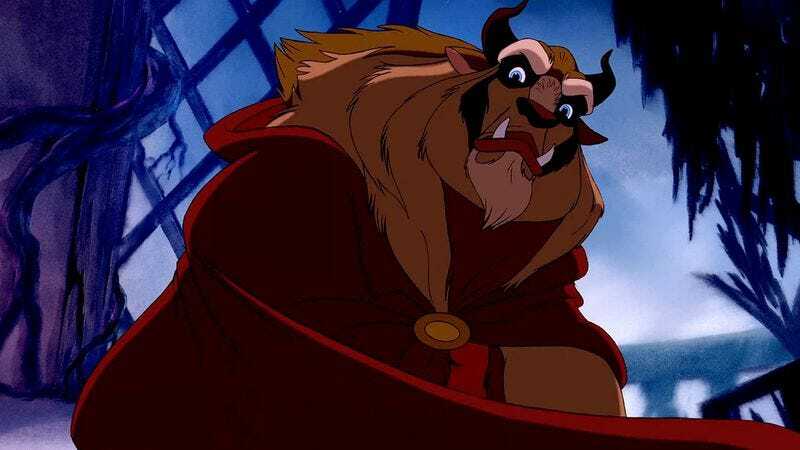 But only Beauty And The Beast comes together completely, with its wealth of fully developed and balanced characters, its beautiful images, its songs, and even Menken’s haunting, Camille Saint-Saëns-inspired score. Though the Disney Renaissance ended with the 1990s, the shift away from animated musicals was in no small part due to the success of Pixar’s films, which rarely feature a character singing on screen. Ironically, it took Pixar’s John Lasseter and Ed Catmull joining Disney Animation in the mid-2000s to revive the animated musical form, starting with The Princess And The Frog and leading up to this month’s Moana and beyond. As encouraging as this development is, the less fortunate reality is that few songs in Disney’s recent musicals reach the same heights as anything in Beauty And The Beast or The Little Mermaid or Disney’s films from the ’30s, ’40s, and ’50s. “Let It Go” is an unquestionable phenomenon, and “Almost There” and “Friends On The Other Side” from The Princess And The Frog are equals to Renaissance-era songs, but few others measure up. The Disney Renaissance is marked by memories of musical numbers, the best of which came courtesy of a man who was only alive through the first few years of the period. Howard Ashman’s shoes are hard to fill, and so is the footprint left by Beauty And The Beast. Ashman’s indomitable spirit is the X factor that makes this movie feel as vibrant, as pure, and as emotionally honest as it does, and is what’s missing from films like Frozen and The Princess And The Frog. The 1991 film aches with life and passion as much now as it did upon its initial release; the songs, the snappy humor, the lush animation, the character development, and even the technical ambition on display (as when the camera swoops up to an angelic mural during the title sequence) are all incomparable. The people at Disney will continue to try to top Beauty And The Beast, and it’s hard to blame them for the effort. But like Ashman’s genius, the film’s excellence isn’t so easily replicated.